As featured in 2019 Blue Ridge Parade of Homes, this stunning cabin boasts a 270 degree long range view of Lake Blue Ridge and the Blue Ridge Mountains. 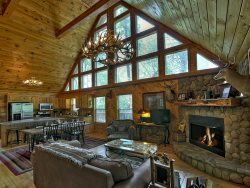 Come vacation with the utmost luxury in cabin like this! The Vue Over Blue Ridge is a one of a kind home offering stunning views and only the finest amenities. The living room located on the entry level offers a cozy seating area with a gas fireplace, plush furnishings and a 55" Flat Panel Television with satellite and Apple TV. The kitchen and dining area, which are both part of an open floor plan with the living room, offer views and luxurious amenities galore. The kitchen is equipped with all stainless Viking appliances, a large marble island, and copper sinks exuding ultimate luxury. The adjacent dining area offers seating for 8 with additional seating for 4 at the breakfast bar. Also on the main level you'll find more personal touches such as the catwalk soaring above and the option of using Russound surround sound (must have app to operate). Located on the entry level, you'll find a King bedroom with a 40" Flat Panel Television and an attached bathroom with a double vanity and a stand-in shower, and a large walk-in closet. Upstairs offers a loft area attached to a catwalk that leads to a private upper-level porch. Off the loft is access to the master King Bedroom with a 40" Flat Panel Television, attached bathroom that offers a walk-in shower, towel warmer, walk-in closet, a kitchenette with a Keurig, a gas fireplace and private screened in porch. The screened deck area off of the master king bedroom offers the option to remove the screen via remote control if desired. The lower level of this home offers two more bedrooms; a King Bedroom with a 42" Flat Panel Television and a Queen Bedroom with a 40" Flat Panel Television. Both bedrooms have their own bathrooms. Also located on this level is the recreation room which includes a foosball table, arcade, den area with 42" Flat Panel Television with Apple TV and a wet-bar with beautiful countertops, an ice-maker, copper sinks, a wine chiller, and dishwasher. Just outside this lower level sits a sunken hot tub and a 32" Flat Panel TV; around the corner is an outdoor day-bed located on the view-side of the home. Continuing around the outer decks of this home, you'll discover another screened in porch with a ping pong table, a high-top table and an outdoor Flat Panel Television. The upper outside level is adorned with an outdoor fireplace and a Flat Panel Television as well as swings and other outdoor furniture and amenities. This cabin is equipped with all your vacation needs completely in mind in order to make your stay as effortless and glamorous as possible. Located in the Aska Adventure Area about 20 minutes from downtown Blue Ridge shopping and dining. Glassed in Gas Fireplace visible from private deck and from bedroom. Team members were good. Very courteous staff and everyone was very friendly. This is my third time using these cabins and I have been pleased each time. staying at this property was worth every penny spent. Coming up the mountain, however, was so scary, I thought for sure I would pass out. lol It was raining and the mountain was very slippery so it felt as if we were sliding down BUT we made up safe and once we were in the house I didn't want to leave back out. It had EVERYTHING we needed and more. The arcade was an added bonus, I hadn't played Ms. Pac-Man in ages. GREAT property all around! We really hated to leave.The rental was beautiful, the views were amazing and the cabin was everything you could ask for a getaway. Loved the Air Force jets that buzzed the cabin one day! You would be much more comfortable and secure if you have an awd or 4x4 driving to the cabin. There are some very steep roads. Cabin is first class the view is the best we have ever had in our 7th time in blue ridge. No instructions on how to use the gas fire place in the main living, Russound was not operational too. The dsl goes sorta strong to very weak. I know we are on vacation but there things Im responsible for at the office. Personal note the pictures of the owners all around is not what we are accustomed too. The kitchen was a first class joy for our Chef Son in law to spoil all of us with. Again the view and the decks are THE BEST!!!!!!! The entire experience was incredible. Upon check in we were greeted immediately by a young lady that gave us all information possible about the cabin and what we could do during our stay for the week in Blue Ridge. When I had to call after hours to get assistance they were very friendly and responsive. When we checked out the young man asked if there was anything they could do to make our next stay any better and the simple answer from me was no, they handled it all to perfection and we will not go elsewhere to rent a cabin in the future. The cabin was simply incredible. It had every necessity and untold amounts of luxury in the woods. The layout of the cabin is perfect and I nor any of the guests with me would do anything to change anything in the cabin. The detail and dcor was very tasteful and the kitchen was awesome. Incredible appliances and wares in the cabin made us feel like we were at home.It is far superior to anything I have seen or experienced and had all the tech you would expect in a current normal permanent home in the city. The view is simply stunning and we will definitely be staying here in the future. We were hoping to see rain as forecasted all week to no avail but on our last evening a shower came through that yielded low clouds and I have never seen anything as incredible as that view. Great job to Southern Cabin Rentals, the architect and the owner, I don't think it could have been done any better. We unfortunately had a guest with us that inadvertently triggered the fire alarm for the home. I contacted the after hours service number. They were extremely helpful and courteous and were able to rectify the situation immediately in a very friendly manner.